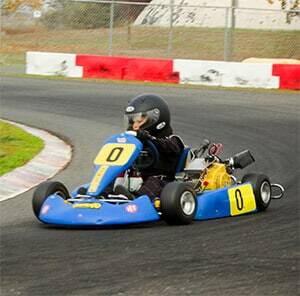 Go-karts and ATVs have become very popular entertainment sources for kids. Beyond mere pleasure, there are valuable lessons to be learned from go-kart riding. While they are gaining driving experience, kids are also burning up energy and getting fresh air. These pleasure vehicles teach kids the fundamentals of safe driving and maintenance of a motorized vehicle. Go-karts also teach kids eco-friendly approaches to their environment. A go–kart or go–cart is a small, non-suspension, four-wheeled vehicle. It may or may not have a motor or electric power source. Go–karts may be pedal-powered or as fast as a high-powered racing machine. These vehicles are driven around a specially created go-kart track which can be a mere loop or a very intricate pathway. Why Buy Your Child a Go-Kart? Pedal go-karts, as the name suggests, are moved by foot pedals like a bicycle. They will go as fast as the driver can pedal. Pedal go-karts are excellent first vehicles for children. They are the least expensive go-kart type and the lightest weight. This vehicle is equipped with a steering wheel and easy-to-operate skid brakes. 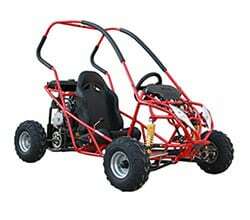 It is considered the safest type of go-kart and is an excellent first one for kids. Electric go-karts, like most scooters and many golf carts, are powered by one or more batteries. These batteries may be electrically powered or solar powered. Electric go-karts are pollution free. They also have precision torque. Electric go-karts are faster than pedal ones. They are also low maintenance. It is simply a matter of keeping the batteries charged. Gas powered go-karts are not recommended for young children. They require more sophisticated driver skills. Gas karts are more expensive to buy and to run. They also require higher maintenance. While not as environmentally friendly gas go-karts are more durable. New go-karts are naturally more expensive than used ones. The average cost of a new kart can run into the thousands of dollars — depending on the type. If you are planning on entering your child’s go-kart into racing competition you might wish to consider a sponsor. There are lots of opportunities to purchase used go-karts. Check e-Bay, Kijiji and other auction sources as well as want ads of your local paper. While it is significantly cheaper to buy used vehicle, like everything else it is “Buyer beware”. Make sure the go-kart is in good running order and has the features you want before you buy. Buy where you can inspect the vehicle —or have an expert do so—before you buy. Aim for a used kart that is less than five years old and in good shape. 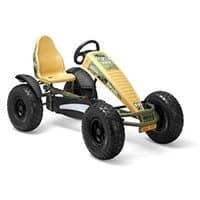 Eas type of go-karts have it’s “Top Brands”, for example, the Trail Master Mini XRX or XRS are often recommended as beginning karts for kids when we talk about electric riding toys. 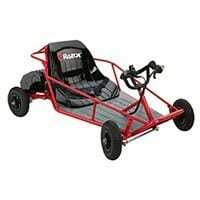 The XRX is an electric go-kart great for kids six to nine years old. The XRS is gas powered and has a sport bench seat that will hold two people. Both are equipped with two with dual 5-point seat harnesses, LED headlights and a horn! A remote cut-off switch lets parents stop the machine if there is an issue. Adjustable pedals move as close as 23 inches from the seat for younger drivers or as far back as 29 inches for bigger kids. The XRS will achieve speeds of up to 12 mph. The welded tubular steel frame and side rails increase safety for beginning riders. 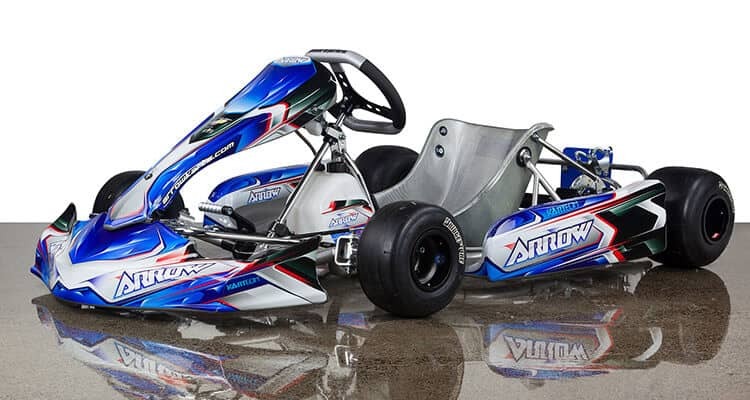 How to Choose a Go-Kart for Kids Relatively lightweight and significantly less expensive that ATVs, go-karts offer kids a chance to do a fun activity in the safety of a well-maintained track under the watchful eyes of adults. Kids of all ages can enjoy this exciting outdoor activity. In upcoming articles we will make a detailed review of each type of go-karts. Join us on Facebook, Twitter, Google+ & Pinterest to stay tuned.